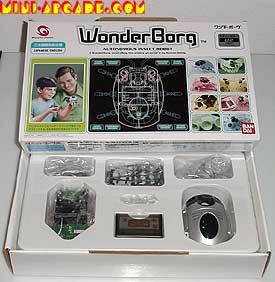 Click here for the original Wonderborg instruction manual! Comments: A very very cool toy to use with the Wonderswan. It is not vintage, but I threw it in here anyways. It is a fully programmable robot with some really amazing features. It comes with a cartridge for the swan, that has a block-styled language, and you make these little decision/action programs. It then uses infared contained in the cartridge itself to upload your programs to the wonderborg's chip. 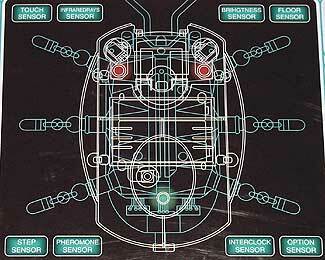 You can program actions to respond to the 8 various input sensors. You can set priority levels for each listening sensor, and you can also interrupt an action to respond to a new sensor that has been triggered. The wonderborg is dumb, until you tell it how to act based on events. Quite an amazing little toy that is already destined for obscurity since it was released in very limited quantities. 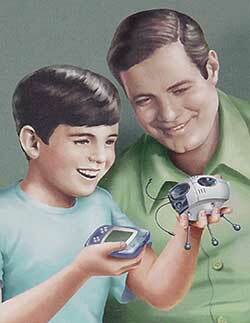 A very strange yet incredible picture on the front of the box. This game/toy was released in Japan only, yet here is a western-looking family enjoying the little borg. 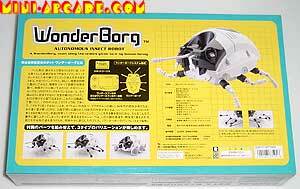 back of box - the pics at the bottom left show the other legs that came with the borg. I personally like using the wheels as the legs.